Turning a messy garage into a beautiful space is what we excel at. First we listen to client needs to understand what you truly want out of your garage storage solution. Next we design garage cabinets and closets that optimize the space and storage available. Our team is able to turn any space into a luxurious garage by creating breath taking designs and using top of the line materials. Turning your garage into a safe haven for your sports car, sports equipment and or tools should be a priority for you. While garages used to be a place that was dirty and kept ignored junk, that has changed. 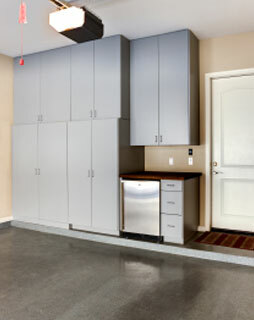 Your garage storage design should reflect the inside of your home and the way you live your life. The options for your garage storage solutions are endless. Our designs even allow you to turn your garage into a place for hobbies such as music production, exercise, and more. The design potential for your garage space in unlimited, allow us to show you how we can create a luxurious garage space for your needs. Our team works with you to build a custom garage closet and storage system that works for your needs. We offer a wide range of style and material options so your garage can be your dream garage. Contact South Florida’s Premier Closets if you want to transform your garage into an extension of your home.